I first started getting interested in dog training 5 years ago when I brought home two hamiltonstovare puppies (Jack & Ben). I was particularly drawn to hounds despite (or maybe because?) of their independent nature. I had been warned by the breeder that the hamiltonstovare was a strong hunter and couldn't be relied on off the lead but I was determined to learn about them and be able to give them the freedom they needed. I attended local obedience training and worked through the basics. At 10 months old the two pups escaped from the garden and disappeared for three days, our first experience of their strong hunting drive. We live in the Loch Lomond and Trossachs National Park, a beautiful part of Scotland, on the edge of forest that is teeming with deer. The local community rallied round to help the search and after 3 days they were found. After that we started to get smarter about closing gates. I put more focus on training recall, getting help from trainers and was introduced to spray collars. 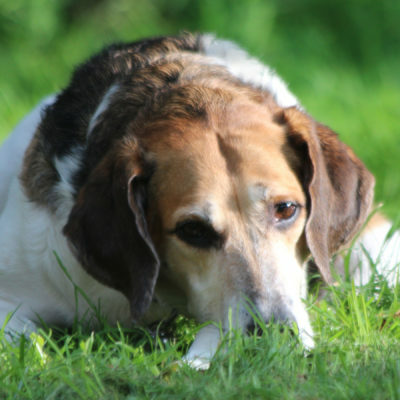 Unfortunately a few months later, relying on a less-than-reliable recall, one of the young hounds, Ben ended up among sheep on a neighbouring farm and had to be shot. An unfortunate event for everyone concerned. Work with recall got more focussed with Jack. 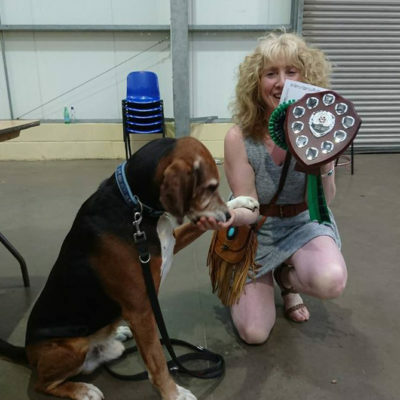 We rehomed a 3 ½ year trailhound, Logan, as company, a hound with good recall. He also had had the good? fortune to have been head-butted by a sheep at an early age so sheep were not of interest to him. could get lost quite a distance away! I sought more help from a dog behaviourist, from people in Sweden (where the hamiltonstovare is from) and I carried on working with Jack. I made progress with a long line in closed-in areas and the recall was getting better. We got better at keeping gates locked but one day someone visited and left the door open....Jack ends up at the farm over the hill chasing sheep. Fortunately this time the farmer managed to catch him. I ended up in front of the judge and received a hefty fine – but I still had my dog! After that my confidence was rock bottom. I've clicker trained, tried positive training with treats, spray collars, and electric collars . I've bought and read loads of books and DVDs about training, training the recall, training 'hard-to-train' dogs. Then someone suggested working with a gun-dog trainer. We made good progress, using a whistle for 'recall' and 'stop' and I started to get a better response from Jack. But although the trainer applauded me on the progress we had made, we still hadn't achieved a reliable recall, with the future looking like Jack will always be walked on the lead, a sorry situation for a hound. It was while I was training with the gundog trainer that I learnt more about dogs' body language, through reading (Turid Rugaas books and DVDs) and paying attention to what was really going on. I started to realise how my emotions were extremely relevant in my interaction with my dogs. Future blogs will focus on dogs and emotions. Working with the gun-dog trainer got me interested in this work, and a total glutton for punishment, I ended up buying a Labrador Retriever puppy (Archie), from working stock. Archie is now nearly 11 months old and often I wonder why I have chosen to make life so difficult for myself! Now I have three dogs, one of which can't be let off the lead, one who makes me jumpy because he might get lost (and I might get in trouble with the law) and a pup who is keen to work and learn, but being a pup will get into anything and everything. Because we live in a rural area, they are also a bit nervous on the lead, when we come across other dogs. Which makes dog walking a bit of an event. It is early days but I am excited about the possibilities that this approach to training offers. Future blogs will include my experience of using NDT and my progress with my dogs. I hope you will join me to hear of my exploits and share your experiences and thoughts. Hi John – thankyou for your kind words. I agree with the idea that its something deeper going on – I subscribe to the idea that your dogs are here to remind you what you have forgotten along the way in the growing up process :-). Being drawn to having 3 dogs, I think I must have forgotten a lot! You are a woman after my own heart. 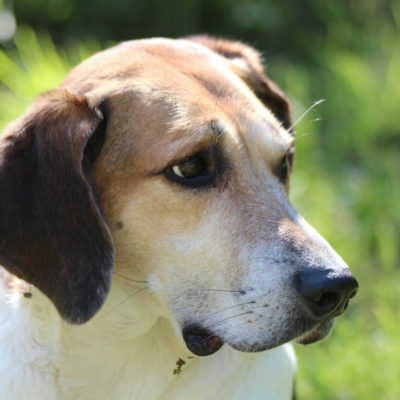 I have a trailhound who is characterful & brilliantly behaved in the home, listens, responds. She is admired & loved by many. 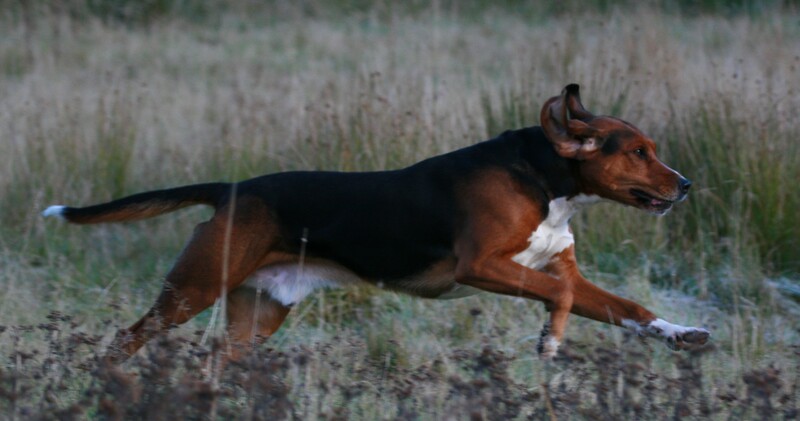 However out in the field she wants to do what she was built to do – run and feel the wind through her ears! She loves life & everyone but is SO independent and remote from me on walks. Yes she comes back but very much in her own time. The wet appears to be worse & this season there have been times where I have felt positively despondant. You cannot keep these gloriously beautiful creatures on the lead yet mastering recall has been so tough and I’m certainly not there yet! . I believe my lesson is patience – but sometime the ‘humilation’ and total lack of understanding from other dog owners of breed traits gets me down. It’s so heartening to read of your experience so thank you for posting it. I’m going to keep the faith & hold on to hope that in time with age and persistance it’ll improve.